I read The Painted Man (also known under the title The Warded Man) two years ago before it was published in Australia and seeing as The Desert Spear was released not so long ago (I’ve been waiting and waiting so patiently for that book) I thought I’d re-read it. My copy is an unproofed version of it which has me constantly wondering how different a proofed version would be and because of that I’m not going to be doing a full review of it. I don’t think that would really be fair to the author (even though two years ago I did review it) as I have no idea how much has been changed or if all the niggly bits that bug me have been fixed (that’s mostly wording, sentence structure, and time line so I’m guessing they would have been). Mostly I’m going to share a few thoughts on it first before reading and reviewing The Desert Spear because I really do like The Painted Man and it is one of those books I have been mentioning to people in hopes that they’ll read it. 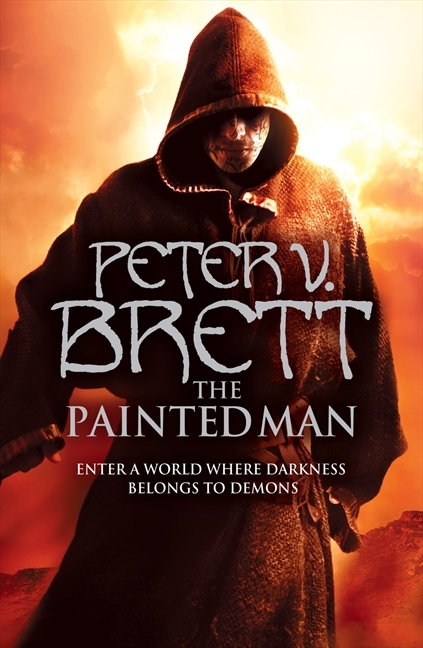 Synopsis for The Painted Man by Peter V. Brett. killing and destroying at will until dawn, when the sun banishes them back to the Core. As darkness falls, the world’s few surviving humans hide behind magical wards, praying the magic can see them through another night. As years pass, the distances between each tiny village seem longer and longer. It seems nothing can harm the corelings, or bring humanity back together. Born into these isolated hamlets are three children. A Messenger teaches young Arlen that fear, more than the demons, has crippled humanity. Leesha finds her perfect life destroyed by a simple lie, and is reduced to gathering herbs for an old woman more fearsome than the demons at night. And Rojer’s life is changed forever when a traveling minstrel comes to his town and plays his fiddle. But these three children all have something in common. They are all stubborn, and know that there is more to the world than what they’ve been told, if only they can risk leaving their safe wards to find it. There’s so many things I love about this book. I’ve been a fantasy fan since childhood, but fantasy also pisses me off because there are so many clichés that can’t seem to be avoided and fantasy, especially classic fantasy, is rarely original. One reason why I love this fantasy is because it isn’t over burdened with clichés and it has a dark edge to it. When I first read The Painted Man I hadn’t read many fantasy based novels with a dark side to it that included demons of some kind (that’s not including supernatural creatures in dark fantasy – shape shifters, vampires, and all that jazz) so I fell in love with the concept and ate it up. The second time around I’ve loved it just as much and yes it has taken me longer, but that’s not the books fault. I went a little game crazy and couldn’t seem to focus on reading. However when I picked the book up again I was able to get right back into it as if I had never put it aside. I even read it till the early hours of the morning because it’s a really hard book to put down even when you know the story. I’m not a fan of the old school use of fantasy clichés in this, but they aren’t so dominate that it turns me off, instead I can barely notice them and when I do it’s from a writer’s point of view and not a reader’s (it’s really hard to review from only one side). I also enjoy the main characters, but really love the character Arlen. They’re all stubborn, as it says in the synopsis, but Arlen just takes it to another level. I love him because he is bad arse, but at the same time he is written in a way that you get a feel for his vulnerabilities showing you he really is just one messed up kid. That probably sounds like it would be a possible Gary Stu character and even I would expect that reading my thoughts on it, but fortunately Arlen doesn’t end up that way at all. I think that has a lot to do with how Brett has written him, the characters in general, and his writing style. Back to Arlen – What I particularly love about that character though is how far he will go to see his goal to the end, even when he loses his way a bit and it all gets skewed. There’s one particular section (I promise that even though this sounds like I’m about to give away a spoiler, I’m not) in the book where he discovers a solution to a problem, but the solution is a little f*cked up when you think about it and yet that doesn’t phase him. He has the mind set where he figures something out or sees something and decides to just do it. I’d say that section would be the pivotal point in the story where these three people have gone from being these young kids to turning out to be the people they will be through out the story. I think that’s why I love that part so much, besides the darker side of it, but if you want to find out about it you’re just going to have to read it (tease aren’t I?). For me too, I think Arlen is the driving force for the whole story. Yes you follow the early lives of all three characters, but when it comes down to it, I think Arlen is by far the most interesting and enigmatic character of the bunch. Don’t get me wrong, I do enjoy the other characters, but the female character does grate on my nerves a little bit (I was thinking about this early in the morning when I had finished The Painted Man and realised there are few female characters I actually like in fiction so that might not be a reflection on the character or how she is written) and Roger’s character isn’t exactly delved into that much or as much as I would have liked. Actually I feel there are parts missing giving it a slightly disjointed feel, but not enough to dissuade me from enjoying it or reading it. And here I’ve gone and done a review rather than just commenting… I can’t help myself. The more wrapped up I get in a book the more I have to dissect it or at least certain aspects of it and I really do love the concept and highly recommend it. It’s not just the characters of course, they do add a lot to it because it feels to me that it is focused around the characters rather than the story, but it’s also the story itself and the imagery. I was particularly impressed with some of the fighting scenes because there was just enough detail there to really help you imagine it, but at the same time it wasn’t over detailed so as to confuse the reader. I’m going to shut about this book now and go and start the next one because I’m too excited to keep typing. I need to know what happens next! … Ok one other thing – Something else I love about this book is that in a lot of fantasy there’s quite a religious aspect to the story with characters being religious themselves, but in this one the main character is a man of science. I think that is brilliant. There’s still religious characters of course, but religion doesn’t seem to be such a focus and it’s really nice to have a few characters in there that don’t think much of it. That makes my day. I just had to share that, so highly recommended if you like a darker edge to your fantasy, or fantasy that isn’t stereotypical classic fantasy, or body art in fantasy.